If you need some unusual and romantic plugins to your love story photo session or wedding photoshoot, these sunset filters are the best decision. If you have no time for learning Lightroom sunset tutorials, you can apply our free filters. Our retouchers gathered the collection of Lightroom presets for sunrise and sunset for you. There are no companies who provide Lightroom presets sunset free in the web, except our website. A selection of wonderful Lightroom sunset presets are suitable for photo post processing taken in gold hours, namely for evening sunny photos. The post processing landscape photography will become even easier and more pleasant, because the filters perfectly fit into pictures taken at sunset. Editing sunset photos Lightroom creates a great atmosphere in the photos and makes you feel as if you watch the sunset with your own eyes. Any of sunset Lightroom presets is appropriate for batch retouching, applied quickly without degrading the quality of the photos. As a result, you will receive very beautiful pictures and sunset split toning. If you do not know how to edit sunset portraits by yourself, download them right now. LR Preset #3 "Warm Light"
LR Preset #5 "Soft Contrast"
LR Preset #6 "Sun Flares"
LR Preset #7 "Soft HDR"
LR Preset #10 "Cold Sun"
Our free selection of sunset presets for Lightroom can be divided into many genres and types of photographs, not necessarily made at sunset. It can be a portraiture, wedding or event photography, night sky or nature photography, and many others. Any Lightroom sunset filter from our collection is applied on the photo very naturally, so you can try to substitute almost all the photos. These beautiful warm and gentle Lightroom sunset filters perfectly match the photos with people, without spoiling the skin and give it a beautiful matte tonal shade. It also makes a unique magic with the sky and the sunset. Lightroom Sunset Preset #1 "Brighten"
This beautiful plugin is more often used for sunsets and dark photos. When using this sunset preset Lightroom, the amount of noise increases, but you can also adjust the settings and make the photo darker. Sunset Lightroom Preset #2 "Film"
One of the top Lightroom presets which can be applied well at any photo with nature or people or objects. The effect brings the photo deep tones, which awakens unseen emotions. Sunset Preset for Lightroom #3 "Warm Light"
A warm and gentle filter is ideal for photographed beaches at sunset. Great for photos with people, does not spoil the skin and gives it a beautiful matte tonal shade. You can enhance sunset Lightroom adding magical colors to the sky. Sunset Preset Lightroom #4 "Cool"
The perfect sunset Lightroom preset which is suitable for photos taken without a flash at a later time of the day. To retouch a portrait photo, this filter will not work, because it can pull the tone of the face into a cool blue hue, but it's not a bad option to edit the usual photos of architecture, vehicles or reportage photos from the scene. Free Sunset Lr Preset #5 "Soft Contrast"
This Lightroom glow effect gives the brightness and soft glow of the setting sun, which touches the beams of each viewer. By changing the curve settings and exposure, the light portions are highlighted and the dark ones are gently blurred. Lr Preset Sunset #6 "Sun Flares"
If you do not know how to edit outdoor portraits in Lightroom, but you really want to give the photos a muted orange tint, the orange vignetting effect is already created for you and ready for download for free. Experiment with this filter and different kinds of photos and find something of your own. 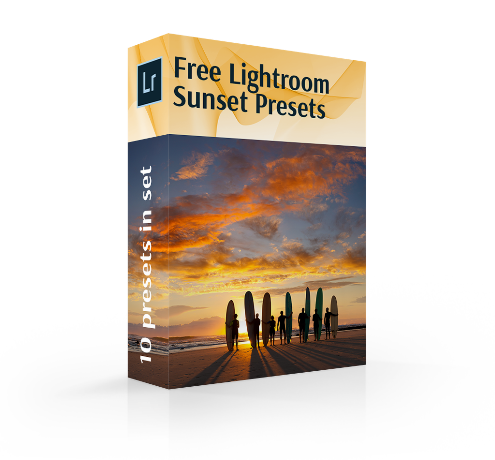 Free Sunset Lr Preset #7 "Soft HDR"
Using the high dynamic range is suitable for landscape and portrait photos. Soft dreamy effect Lightroom saturates the entire photo with a palette of colors of the setting sun. LR Preset Free #8 "Darken"
No selection of the best free presets for Lightroom is complete without the most popular and most used black and white effect. Even a combination of these 2 ordinary colors will cause delight and will emphasize any detail in any photo, regardless of genre. Sunset Lr Preset Free #9 "Clarity"
This is one, but very amazing sunset preset Lightroom, which will suit many genres of photography and will be an excellent addition to image post processing. In the plugin, the slider of adding noise to the photo does not move much, so fans of “clean” photos should pay special attention and choose their own meaning of “adding noise”. Lr Preset for Sunset #10 "Cold Sun"
Free Lightroom brushes will produce a stunning effect especially with landscape photos taken at sunset. And if you know how to edit sunset portraits in Lightroom, then you can play a little with the settings and apply this plugin to the portrait photo, giving the skin color a more natural color. Darkening. A slightly underexposed image will make the colors more saturated and concentrated. The image becomes more dramatic. Sunset photos in Lightroom will find deep and emotionally saturated colors and shades with the use of our filters. Changing the white balance. Using Lightroom presets free sunset you will get beautiful golden tones even if the sunset is dim by changing the white curve. Capability to apply the effect of HDR. It's true that the sunsets look amazing when the HDR effect is added. This action makes any photo with nature more saturated and bright. Clarity/darkening. Clarifying photos helps emphasize details in dark areas. Darkening will help if there are too bright areas. Adjusting of color. Sometimes it is not enough just to lighten a photo, for this you need to correct the color balance. This function of Adobe Lightroom sunset preset will certainly make the photo more natural. Increasing the contrast. Thanks to this setting, the picture becomes more voluminous and lively. In order to avoid problems and other difficulties, our specialists selected each setting parameter in details by creating this collection of Lightroom sunset presets. Hope these Lightroom sunset presets will save your time. Try and be inspired.